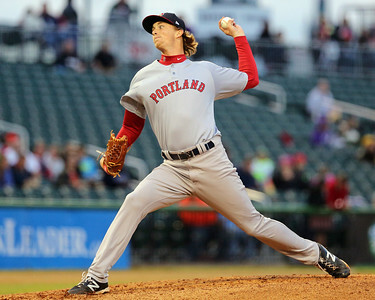 Yesterday the Double-A Eastern League announced its All-Star rosters and the 24-man roster featured five members of the Portland Sea Dogs: left-handed pitchers Henry Owens (pictured, right) and Brian Johnson, catcher Blake Swihart, infielder Sean Coyle, and infielder/outfielder Derrik Gibson. Each team has at least three All-Stars, with one pitcher and one hitter from each team being selected through a fan vote. The fans' Sea Dogs pitcher selection was Henry Owens and the fans' hitter selection was Blake Swihart. 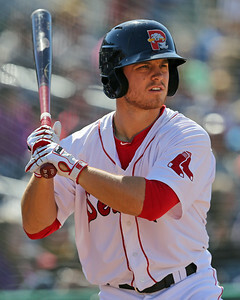 Swihart currently ranks second on the SoxProspects.com rankings after an impressive start to the season. Over 272 at-bats, he has hit .294/.347/.474 with nine home runs, which puts him in the top 20 in the league in average, slugging, OPS, and hits. He also has had major impact defensively throwing out a league best 53% of attempted basestealers. It is this performance that has valued him to be in the discussion for the best catching prospect in baseball. Having already earned four SoxProspects.com Pitcher of the Week awards this season, Owens inclusion on the All-Star list is no surprise, especially after news that he will also be a part of the U.S. Team at the Futures Game. He is coming off one of his best starts of the year where he went 7 innings, allowing two hits, a walk, a run, while striking out 10. His overall numbers on the season are staggering with his 2.21 ERA, 1.03 WHIP, 111 strikeouts, 12 wins, three complete games, and two shutouts all tops in the league. Brian Johnson joins Owens on the All-Star team after a early promotion from Salem. Since being promoted he has started 12 games and has a 2.64 ERA and 1.18 WHIP, with 55 strikeouts and 19 walks over 64 2/3 innings. Those stats make him more than worthy of a spot alongside Owens, and have pushed him all the way up to the sixth spot on the SoxProspects.com rankings. After being overshadowed by top prospect Mookie Betts, Sean Coyle's (pictured, left) performance is getting the recognition it deserves after putting up Mookie like numbers to start the year. Over 204 at-bats Coyle has hit .348/.424/.603 with 11 home runs, and his average, slugging, and OPS would top the league if he has enough at-bats to qualify. Like Owens, Coyle will be a part of the U.S. Team at the Futures Game, and it has pushed him to the 12th spot on the SoxProspects.com rankings. Gibson, the super utility player, has flown under the radar but his performance speaks for itself, putting up a .323/.411/.425 line over 226 at-bats. Those stats have him at 9th in the league in average and 4th in OBP. It is Gibson's third year in the Eastern League and an All-Star selection is a well earned honor. The Sea Dogs currently lead the East Division by an impressive seven games and have six more wins than any team in either division. While their five selections tied them for the second most selections among Eastern League teams, they still had several other worthy selections including reliever Noe Ramirez, outfielder Henry Ramos who is currently on the DL, and Mookie Betts and Deven Marrero who were promoted earlier in the year. The Eastern League All-Star game will take place Wednesday, July 16th at Peoples Natural Gas Field in Altoona, Pennsylvania. Photo Credit: Henry Owens and Sean Coyle by Kelly O'Connor. Will Woodward is a Staff Writer for SoxProspects.com. Follow him on Twitter @SPWill.